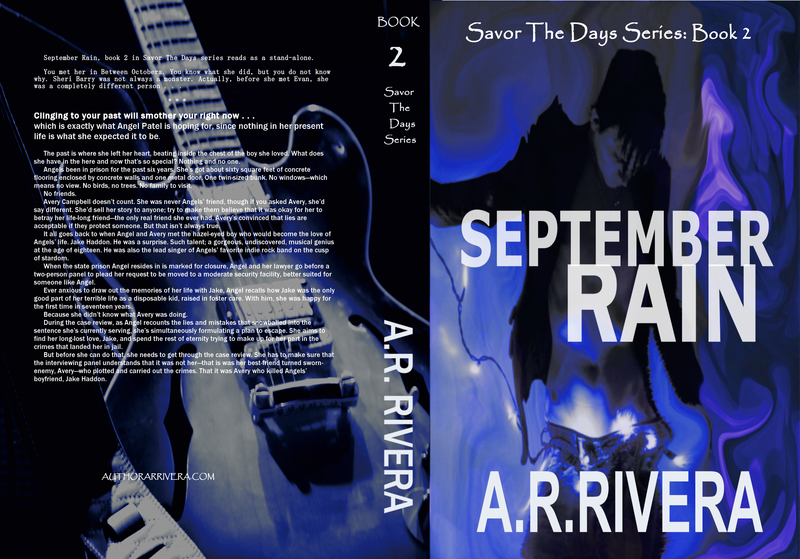 September Rain, book 2 in Savor The Days series reads as a stand-alone. Watch Closely. It’s about to get crazy. Clinging to your past will smother your right now . . . which is exactly what Angel Patel is hoping for, since nothing in her present life is nothing like what she planned. The past is where she left her heart, beating inside the chest of the boy she loved. What does she have in the here and now that’s so special? Nothing and no one. Angel’s been in prison for the past six years. She’s got about sixty square feet of concrete flooring enclosed by concrete walls and one metal door. One twin-sized bunk. No windows—which means no view. No birds, no trees. No family to visit. No friends. Avery Campbell doesn’t count. She was never Angels’ friend, though if you asked Avery, she’d say different. She’d sell her story to anyone; try to make them believe that it was okay for her to betray her life-long friend—the only real friend she ever had. Avery’s convinced that lies are acceptable if they protect someone. But that isn’t always true. It all goes back to when Angel and Avery met the hazel-eyed boy who would become the love of Angels’ life. Jake Haddon. He was a surprise. Such talent; a gorgeous, undiscovered, musical genius at the age of eighteen. He was also the lead singer of Angels’ favorite indie rock band on the cusp of stardom. When the state prison Angel resides in is marked for closure, Angel and her lawyer go before a two-person panel to plead her request to be moved to a moderate security facility, better suited for someone like Angel. Ever anxious to draw out the memories of her life with Jake, Angel recalls how Jake was the only good part of her terrible life as a disposable kid, raised in foster care. With him, she was happy for the first time in seventeen years. Because she didn’t know what Avery was doing. During the case review, as Angel recounts the lies and mistakes that snowballed into the sentence she’s currently serving, she’s simultaneously formulating a plan to escape. She aims to find her long-lost love, Jake, and spend the rest of eternity trying to make up for her part in the crimes that landed her in jail. But before she can do that, she needs to get through the case review. She has to make sure that the interviewing panel understands that it was not her—that is was her best-friend turned sworn-enemy, Avery—who plotted and carried out the crimes. That Avery is the real murderer.